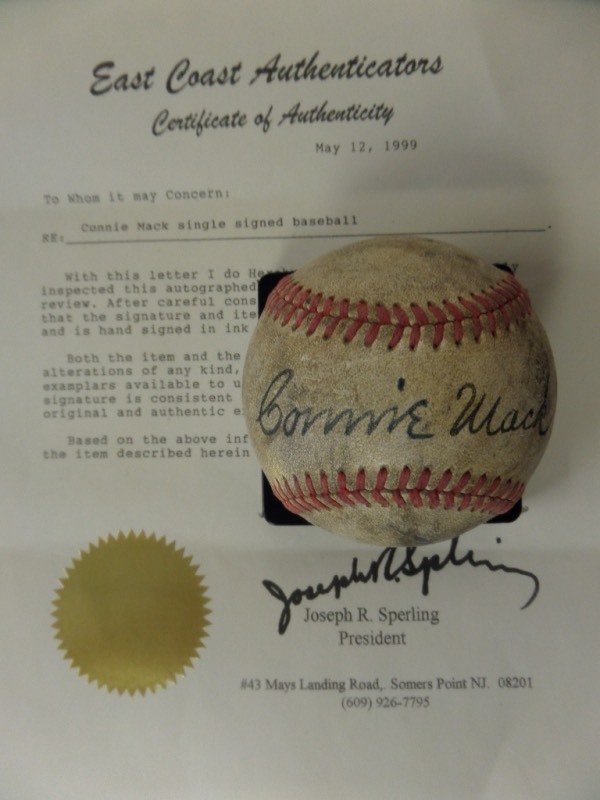 Coach's Corner - Connie Mack single signed/certified vintage baseball! Go Back to Lot List Connie Mack single signed/certified vintage baseball! This vintage, red-laced offering is in G+/VG overall condition, and comes sweet spot-signed in bold black fountain pen ink by one of baseball's most immortal figures, HOF A's Manager/Owner, Connie Mack. The signature grades a strong, legible 7-7.5, including an 8-2-52 dated inscription, and the ball comes with a full LOA from East Coast Authenticators for authenticity purposes. Tailor-made for any baseball collection and valued at over a hundred times our very skinny minimum bid!